Axialis IconWorkshop - The Professional Icon Authoring Tool! Icon creation has evolved. Use the industry standard to create, extract, convert, manage icons for Windows, MacOS and toolbars. It supports all existing icon formats up to Windows Vista (256x256 PNG compressed icons) and Macintosh OSX Leopard (512x512). If you are a developper, you will appreciate a plugin which permits working efficiently with Visual Studio. It creates a bridge with the VS IDE to enhance your workflow. 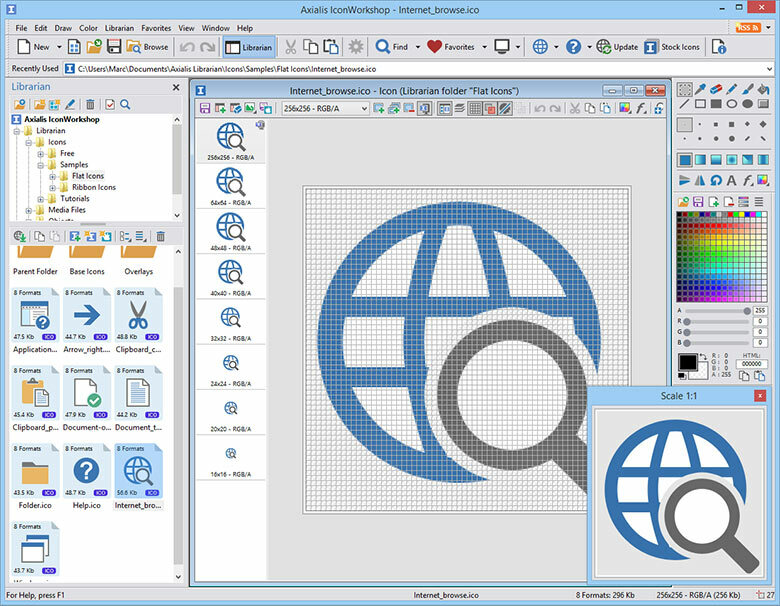 It is the only icon editor which permits creation and edition of Image Strips for toolbars. Do not struggle with wide bitmaps anymore! Just open them in IconWorkshop and edit each icon separetely. Use drag and drop to easily create attractive icons from various ready to use image objects in seconds. Several packs of image objects is included in the product (more than 2000 objects). A powerful editor permits to create icons using many tools including numerous filters and effects. Once an image is created, add several images formats in one click. Create icons from images with alpha transparency (PNG, PSD, J2000, BMP, GIF). Create PNG, JPEG 2000 and Web optimized GIF images from icons. If you work with Photoshop and Illustrator, you can import PSD images with layers and use the plugins to transfer images in memory and make your icon in a few clicks. 10 Photoshop Templates permits to create your icon with different formats in Photoshop and transfer them in one step to create your icon. Numerous batch procedures have been implemented in IconWorkshop to automatically perform operations on a large number of files. Convert several icons between Macintosh and Windows OS in seconds. Use a powerful librarian to easily manage all your icon and library (ICL) files. A file explorer permits to browse disks and work with files (images, icons, programs...). This explorer displays files in thumbnail preview mode. Use an exhaustive help system including getting started lessons, how to procedures and the reference manual.